Home ARTICLES and Columns Thanks for Your Sochi Prayers that Helped Joy Win! Thanks for Your Sochi Prayers that Helped Joy Win! Opinion: As an Olympic skier, I want to thank all those who prayed for the joy and safety of everyone at Russia’s surprisingly “awesome” games. Joining with the Olympic families, were Christian Scientists, Native Americans, Aetherius Society, Monks of Moscow and so many more to help preserve this greatest force for Peace, Understanding, Healing, and Unity for over 1,000 years in Ancient times, and 100 years in Modern times. I invited Canada’s John Woodsworth, who translated the amazing Ringing Cedars(.com) books about Siberia’s mystic Anastasia, to participate in a Cherokee-led prayer for the joy and safety of the Sochi. Amazingly, I learned that as a Christian Scientist, he was already praying for them, as they also did for the similarly high security Utah Olympics, where again prayers blessedly worked. I met some of the Monks of Moscow at a celebration at Harvard in appreciation for their protecting their celestial monastery bells from being melted down in the Stalin period – a shining moment. The coordinator graciously let the monks know that many were praying in solidarity with them for Russsia’s Games. I also learned that Christian Scientists pray every day, like the Native American Elders and monks. Sochi’s prayer groups brought to light these diverse faiths, unbeknownst to each other, calling on Creator to protect this greatest force for Peace. Since scientists found war is the biggest cause of the man-made part of heating the planet, peace is critical to healing Mother Earth for all Her children. Coincidentally, Woodsworth said that an environmental leader of the First Nations of Canada said they see Nature like Anastasia. Raised by animals in the Taiga, she went on to inspire 30 million Russians to grow organic gardens with lots of fruit trees, so few in Russia go hungry, while also cleaning up their water and air quality. With America having more fires than any other country, and 17 million of our children going hungry, Olivia Ellis PhD, past President of Virginia’s Nelson County Master Gardeners and my Cherokee advisor, told me about this blessed solution that also reduces diobesity from malnutrition: Any service organization can partner with you to get FREE or one dollar organic fruit trees from their State Forestry Departments for schools, churches and communities to also repair erosion from all our fires! Plus local Master and Jr Master Gardeners and the 4H all want to gladly assist for FREE! Demonstrating more cross-cultural as well as cross-species like-mindedness, Olivia led a group of healers in a prayer for the protection of Sochi. She also included the ocean and marine life, and hoped a few dolphins might show up. Instead, “We were stunned and overjoyed to see hundreds of dolphins coming on the waves, each swell with curved black bodies bouncing through the foam.” So the dolphins were also happily supporting the safety of the youth at Sochi! Japan’s world renowned Water Guru Dr Emoto proved why the dolphins were happy, that when we give love and appreciation to water it raises its vibration and purifies it, so all marine life, as well as mountain life feel vibrant and rejoice! That is why Dr Emoto often partners with the Indigenous to assist communities around the world to restore their water sources. The Olympians at Sochi instinctively did the most to preserve their Games through purely focusing on what they love to do and through their unprecedented joyful high vibration. As a downhiller and pioneer of freestyle it felt like as we raised the difficulty factor, especially of the aerials, we also raised own vibration in the zone, which some feel is spiritual. It is a cross between the adrenal rush of alertness and oneness in a war zone and prepping to firewalk barefoot on white coals. While there were many falls from changing conditions at Rosa Khutor and other venues, no Olympians (we know of) got seriously hurt thanks to your prayers. Kudos also to our women freestylers whose meeting at Mt Snow in 1971, (thanks to owner Mark Fleischman when I was Director of skiing), came up with the safety regulations adopted by the U.S. then ski world – “the steepness the landings must equal the steepness of the jump to prevent compressing vertebrae.” That launched the super fun, safe as possible, jumping parks for skiers, boarders and slopestylers around the world getting high naturally. We pioneers never imagined the phenomenal feats showcased by the athletes at Sochi. Wow! One of the most spiritual ski events that sadley didn’t make it into the regular Olympics was ski ballet. It felt like I was embracing the mountains snowdancing down them (free of ski poles.) The 80 yr old Elders of the US Ski world, Doug Pfeiffer, John Fry, and Mort Lund, along with MTV and other press during Sochi, told me they would love to see ski ballet/snowdancing be reborn at the Olympics, since more recreational skiers can safely enjoy it. (I teach Native kids, heads of state and corporate execs to ski holding hands on their first day – which people applaud – and some do 360s.) Plus with male skiers evolving beyond calling ski ballet “Balgay,” a better judge of snowdancing is Russia’s icon Baryshnikov. He called my pairs ballet with Serge Rudnunsky, which was spread out over Mammoth’s majestic backdrops, “fun, imaginative with lovely lines,” which Live Science featured during Sochi. http://www.livescience.com/43093-5-winter-olympic-sports-that-never-made-it.html . To set the record straight, MTV ran this stunning ski ballet from Willy Bogner’s “Fire and Ice,” which is mislabeled on youtube. This is not me partnered with Canada’s World Freestyle Champion John Eaves, but the fab 7 X World Ski Ballet Champion Jan Bucher, who followed me. Thanks to her skating background and being part Ute, dancing and mountains were royally in her blood! Wouldn’t that be dreamy to see at the next games? Instead of spending tens of millions on security to protect everyone from a handful of distraught suicidal Black Widows, doesn’t it make a lot more sense to spend a fraction of that on hosting joyful Olympic Exchanges? Unless we proactively focus on healing those who have been wronged or marginalized, terrorism will increase on Earth, OR We the People can choose compassion and a harmonious world through these joyful sports outreachs. By also providing opportunities for the women and children of the disenfranchised to help heal their wounds and restore their joy… And including more Indigenous, whose ancient wisdom, 192 UN countries agreed in 2012, are critical to regenerating Mother Earth, the IOC can fulfill its mission of including all earth’s children and making the games sustainable. Since integrity with Nature and preservation of “LIFE” is critical to a sustainable Olympics and restoring a lean and clean happy human race, modeling and honoring this kind of Ancient Wisdom also needs to be an Olympic Pillar. Here is the other win-win. The summer after my 68 Olympics, I felt a little empty living on Planet ME for so long. Something was missing. What changed my direction in life was being invited by Vice President Humphrey to be a part of a team of summer Olympic heroes giving clinics in America’s “ghettoes” after 120 cities had burned. As the advance person they had me to wear my silver Olympic Team Downhill suit. It got the great turnouts, and I saw how showing these struggling talented underserved youth that we cared, created amazing harmony that rippled. It felt like the Olympic high continued. Basketball’s “Earl the Pearl” Monroe, swimmer Donna deVarona and gymnast George Hery agreed. Jon Ghaffaris, an Iranian teenage skier who was there in 1977 told us, “I put your film on youtube and it went viral last year lifting the hearts of Iranians around the world.” So he immediately proposed an Iranian-Native American Ski Girl Exchange. Shockingly, I couldn’t find any funding from Washington to keep building these critical bridges, but hopefully others can. Especially after our US Olympic wrestlers, who are beloved by Iranians, pricelessly reopened the diplomatic door last year for Secretary of State John Kerry. Our Native American Olympic Team Foundation (NAOTF.org), guided by the Elders, helps orchestrate these Native-led prayers. Plus, inspired by that White House Olympic outreach in 68, our team of Olympians and tribal leaders have been enlightening ski areas who have brilliantly invited over 10,000 Native youth to enjoy snowsports in their ancestral mountains for the last 18 years. Telluride’s owner Ron Allred said, “This is a good way to honor and heal the past and start a new beginning.” The Utes agreed. These outreaches also inspire their Elders to lead priceless snowdances when the ski areas have droughts “to help create more harmony between our cultures and Mother Earth,” said the beloved Southern Ute Elder, Eddy Box Jr, whose family-led ceremony saved Vail in 1963, covered by CBS´Huntley-Brinkley Report. This historic healing then rippled to Maine’s Mt Abram, NSAA’s Golden Eagle Eco Award winner, inviting the Wabanaki Alliance (People of the Dawn) thanks to Jamie Schechtman. And on March 7, Virginia’s Bryce Mt announced inviting their tribal youth, like the Cherokee and Monacan to ski, thanks to its German exec Manfred Locher. The People, especially the world’s youth, like Colorado’s 13 yr old Xiuhtezcatl Martinez, founder of Earthguardians.org in 100 countries, are crying for our governments to spend more on peace-building sports and Arts exchanges. That will free up more tax payers funds to mobilize green energy to slow down what Secretary Kerry, a skier, called “our greatest threat, Climate Change.” In so doing, our Winter Olympics can go on generations longer. Therefore, this is a pivotal time for private and public outreaches. 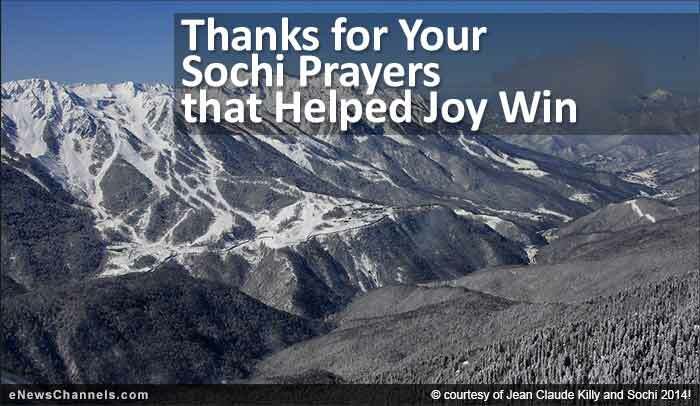 To all who sent prayers that helped Joy Win at Sochi, CONGRATULATIONS! You won the Gold for your collaborative ‘work of heart’ that helped Sochi be a Global Green Love Fest. We thank you Creator and ask You to extend those prayers for the joy and safety of the incredible life-lifting Sochi Paralympians. And also to the People of Ukraine, for the most peaceful highest outcome, learning from the Olympic ideals that President Putin and the Russians hosts embodied so beautifully at Sochi, despite different beliefs! COVER PHOTO CAPTION (top of article): Sochi’s Rosa Khutor Ski Resort, site of the Alpine events nestled in the awe-inspiring pristine Caucasus mountains. © courtesy of Jean Claude Killy and Sochi 2014! Article is Copr. © 2014 by Suzy Chaffee and originally published on eNewsChannels.com – all commercial and reprint rights reserved. Opinions are those of the author and may not reflect the opinion or policy of this site or its publisher. Content has not been edited beyond simple typo checks in order to retain the author’s unique voice. READ MORE from Suzy at: https://enewschannels.com/author/suzy/ .